Tan Mavitan's "Tank" is a life-size model, made from padded leather and metal. Filling the first floor of the exhibition, it is a disturbing tongue-in-cheek reminder of the power, as well as fragility, of military and state bureaucracy. If you visit Sabancı Museum this week, you will realize the extent to which ex students of Sabancı University's Visual Arts and Visual Communication Design Program transformed Turkey's contemporary art scene. "Oh, she is from Sabancı too?" you ask yourself in front of one work; "I had no idea that these two artists attended the same class," you say as you look at another. A 15 minute walk among the galleries of Sabancı Museum's exquisite building in Emirgan clarifies the invisible bond that connects those 20 artists whose works are on display here: a certain irreverence, a certain dark humor that never reaches the level of cynicism and a certain perfection of visual taste and artistic material. Visitors are probably familiar with most of the artists whose works are on display in the "Reunion" exhibition, which continues until July 26. Bayram Candan, Aslı Narin, Hayal Pozantı, Berke Soyuer, Tan Mavitan, Erdem Taşdelen, Meriç Algün Ringborg, Beyza Boyacıoğlu, Onur Ceritoğlu, Egemen Demirci, Deniz Gül, Elif Süsler, Burcu Yağcıoğlu, Deniz Üster, Hasan Salih Ay, Ege Kanar, Baptiste Croze, Julia Kul, Cemre Yeşil and İz Öztat are among the most valued, respected and sought-after young artists currently working in Turkey's art scene. In her introductory text to the exhibition, Güler Sabancı, the founding president of Sabancı University, emphasizes the importance of young artists in influencing societal change. "Art today inspires cultural and social change, and artists, as the bearers of universal identities, spearhead societal transformations," she writes. "It is inevitable for the new generation to value the freedoms accorded by universality, while simultaneously defying its totaling effects. The young generation is responsible for exploring different ways of resisting the standardization of art and culture." One such attempt at undermining standardization comes from Tan Mavitan whose works have been exhibited in the past in New York and Chicago; his triangular notebook design was exhibited in the MoMA Design Store. 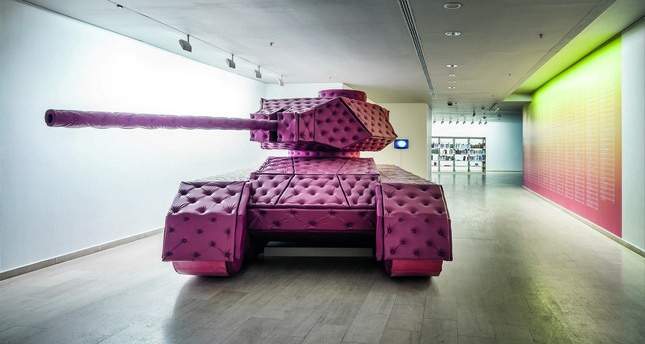 Mavitan's "Tank" is a life-size model of a military tank, made from padded leather and metal. Filling the first floor of the exhibition, it is a disturbing and tongue-in-cheek reminder of the power, as well as fragility, of military and state bureaucracy. "Though this material is in common use elsewhere, in Turkey it has become an extremely powerful, highly specific symbol: that of the state bureaucracy and its political power," art critic Aslı Çetinkaya reminds us in the exhibition catalogue. "We no longer know how and for what practical reasons quilted leather-like upholstering entered the state institutions, but wall paneling, desk pads, door surfacing and the like made of that material are much more interesting and functional for the symbolic references they carry." Meriç Algün Ringborg's "The Library of Unborrowed Books" is similarly symbolic in its approach to themes like artistic value and forces of the art market. Created in collaboration with international libraries, the work came into being after Ringborg collected books that were never borrowed from a number of libraries around the world. Among the unborrowed books I spotted on the shelves of Ringborg's work were titles by Marcel Proust, Henrik Ibsen and Oliver Sacks. "The ridiculous hype and grotesque immoderation of the contemporary economies of attention ensure that we always doubt our own ability to judge and assign value to a product," curator and lecturer Işın Önol explains. "The art world is a particularly egregious example of these dynamics. And yet it still remains among our fondest hopes that unheard voices, unread books, and unseen people will catch the attention of a perceptive soul." Deniz Üster's "Beyond is Before," a mixed media installation with an HD film, stones, sand, cement, glass, earth, wood, screen and speakers, brings us to an area where people may be excused for feeling a bit like unborrowed books. Born in 1981 in İstanbul, Üster studied at the Glasgow School of Art after graduating from Sabancı University. In Turkey, her work had been exhibited in numerous international venues, including Co-Pilot in Istanbul and the ICA in London. Produced by the Farook Foundation, "Beyond is Before" features a nomad who struggles to keep alive in an apocalyptic future. Shot near Dubai, the 40-minute video's aesthetics bring to mind such films as "Mad Max" and Star Wars." As art critic Övül Durmuşoğlu describes it, "In a plot recalling prehistory where earth turns into sand and species become extinct, where water is replaced by a pink alchemical fluid, a nomad from the Central Asian plains (with his desert vehicle, his orange tabby cat in a cage, sack of salted fish and tent) unhurriedly enacts a ritual with unfamiliar codes at the pace of Üster's kinetic sculptures." Filled with stone, sand and earth, the installation itself seems like an extension of the film shown on the work's screen. Egemen Demirci's 15-minute-long video "Spectator on White," one of my favorite works in the exhibition, is an homage to Kazimir Malevich's suprematist masterpiece "White on White." It shows three spectators who view art in different gallery spaces. Reversing the relationship between artwork and spectator, it transforms the viewer into an artwork. "This is not a thematic exhibition," according to Erdağ Aksel and Selim Birsel, two Sabancı University faculty members and artists who worked in the exhibition selection committee of "Reunion." "Eventually, we came up with the idea to exhibit a selection of the works of young artists who had graduated from Sabancı University, many now in their mid-thirties. We were keenly aware of the fact that simply graduating from Sabancı University could not be an appropriate criterion for participation in such an exhibition. We were thinking of an exhibition worthy of the museum, and thus wanted the works selected for such an exhibition to be truly 'of museum quality'." Once they received applications from ex-students, the selection committee carefully reviewed the works. "The number of applicants being far above the capacity of the museum grounds, the selection had to be stringent." "One might at first glance find the exhibition eclectic, but we consider this outcome in line with the educational approach of the Visual Arts Program at Sabancı University, which is open to different personalities, talents and inclinations independently of the studio instructor's personal attitudes," they point out. "This approach has led to the emergence of a varied, pluralistic and eclectic student output, which is precisely what we intended and favor."